Determining the right time to harvest your cannabis plant is important. It will determines the taste and smell of the weed and how strong the effect of the cannabis will be. If you harvest the weed plant too early, the cannabis will be less potent. Harvesting too late will reduce the THC content and make the weed less potent. The chance of budrot or other fungi in outdoor cultivation also increases if you leave the cannabis plants for too long. Voorral with the humid late summer we know in the Netherlands and Belgium. Determining the right moment can be done in different ways. The most accurate is to view the trichormes with a microscope. The shimmering hairs on your weed buds are called trichromes. Based on the color you can determine what is the right time for you to harvest the plants. Depending on how ripe the weed is, the trichromes are transparent, cloudy or amber brown. Every grower has his preference when the best time is to harvest. Most trichromes are clear: This is not the right time to harvest. Want a higher yield and stronger weed. then you still have to be patient. Almost all trichromes are cloudy: From now on the amount of THC in your weed is optimal. Because they do not all develop equally quickly, there will be some trichromes that are clear. 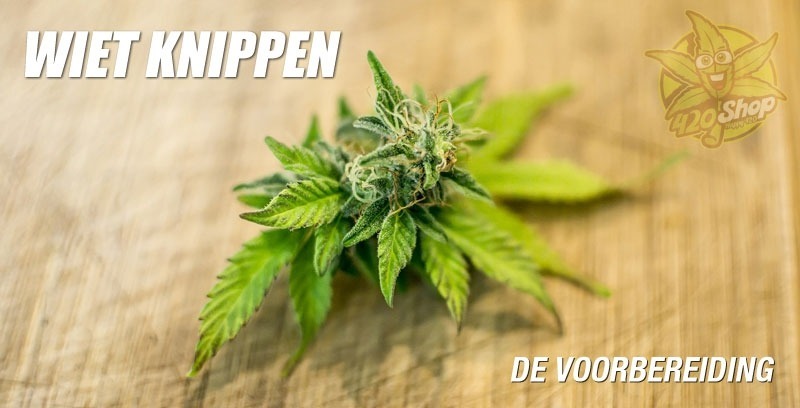 If you like strong cannabis with a lot of THC, this is the right time. 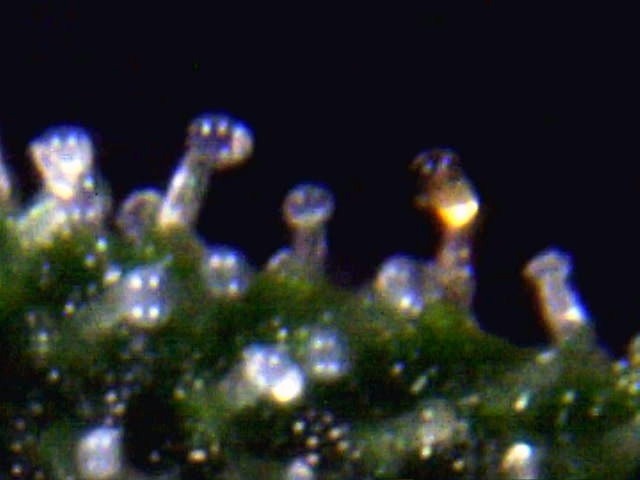 The trichromes become amber: When you see that the trichomes get a brown color, this means that the THC will break down. You will harvest a little less potent weed. The THC is converted to another cannabinoid, namely CBN (Cannabinol). High concentrations of CBN make your weed more narcotic. Due to the decrease of THC the weed will be less psychoactive. This is ideal for medical users who benefit more from an analgesic effect. Becoming stoned is often an undesirable side effect. On this photo you can see that the trichromes are mostly cloudy and slightly amber. If you do not have a microscope or want to buy, you can also look at the flowering hairs of the plant. In the beginning of the flowering phase, the female cannabis plant makes white hair. These brown over time. Most weed growers harvest when about 70 to 80% of these hairs have turned brown. It is also possible to harvest earlier, of course, we recommend waiting until at least half of the hairs become brown. The cannabis will be less strong and the effect more energetic. When you have decided to cut your weed plants, it is important to take into account and prepare a few things. Provide a clean room for cutting. If necessary, lay a plastic post on the floor. In case you drop a fresh sticky cannabis top it is not covered with dirt and hair. Use plastic gloves if necessary or wash your hands thoroughly beforehand. Buy a good pair of scissors for trimming weed. Clean the scissors in advance. Make sure that your plants get no water in the 24 hours before harvesting and the humidity is low. Cut the large leaves away from the plant. You can keep the smaller leaves with resin on them to make later Ice O Lator hash. Flushing cannabis plants before harvesting. The flushing of your cannabis plant is important for the taste of the weed. Stop feeding about 2 weeks before the harvest. Experienced growers will be able to assess this better by inspecting the trichomes daily. The last two weeks of the flowering period are intended to flush accumulated nutrients and salts from the soil. By removing all nutrients from the medium, the plant begins to consume its stored food reserves. These nutritional reserves are substances that you do not want to smoke. Substances such as sugars, starch and various other elements will negatively affect the taste of the weed. Flushing the medium should start about 14 days before the harvest. Use only pure water during this period to feed the plants. By giving no nutrients, the plant depends on the food that is still in the growth medium. The rinsing itself is done by fully irrigating the medium until the nutrients are dissolved on the inside and flushed out of the bottom of the pot. The best way to do this is with a two-part flush. First allow the culture medium to overflow with a large amount of water and wait a few minutes to break down all salts (build up of nutrients). Then add more water to rinse out the first dose. By waiting a few minutes after adding the first dose of water, give enough time to dissolve the salts in the water. Because of this, they can effectively be flushed away by the second rinse. A few days after flushing you will see signs of nitrogen deficiency in the cannabis plant. The leaves will go from dark to light green and eventually turn completely yellow. Another sign is the reding of the petioles, starting in the middle of the leaf where the leaves meet. Test your flush by breaking a leaf and tasting the juice that flows from the stem. If the taste is bitter, there is still too much food in the system of the plant. When the juices are clean and taste like pure water, the plant is clean enough for the harvest. You can cut the plant in its entirety. You can leave it in the pot or cut it off at the trunk. Start with the large leaves so that there is more space to cut the smaller leaves. Once you're done, you can hang up the whole plant to dry. Another way is to cut the plant branch by branch. This method cuts a bit easier. After cutting, you hang the branches upside down in your dry room.